These conditions of participation are valid for registration and participation at Europäisches Musikinstitut Wien / European Music Institute Vienna. By sending the registration the participant agrees with these conditions of participation and abides by them. All courses are open to both active participants and to auditors. Students who are not admitted by the teacher as active participants, due to a lack of adequate prior training, may attend the course as auditors. In such a case, the difference between the tuition fees for active and passive participation will be reimbursed. The number of active participants is limited. Registrations will be considered according to the date of reception. Active participants will only be accepted for the entire duration of a course. Registration of a participant-under-age has to be made by his parent or legal guardian. Should the minimum of valid applications for a course / workshop not have been reached by 01 June 2019, the administration reserves the right to shorten the course (intensive course), although this measure will not reduce the lesson units per participant, or to cancel the course / workshop. The administration reserves the right, should an instructor be prevented from attending, to provide a comparable substitute at its own discretion or to cancel the course. Should a course be completely cancelled, all paid fees will be reimbursed to the participants. No other claims will be recognised. Master courses: a minimum of 180 minutes of individual lesson per active participant is guaranteed. Workshops: please refer to the individual course description. The disposition of lessons and the schedule falls to be determined by the instructor of the respective course. Passive participants may receive one unit of individual lesson with the course instructor’s permission (price upon request). Students may audit all courses in the curriculum. Practice rooms are free of charge for active participants. Every course ends with a public final concert by its best participants. Each active participant will receive a diploma; each passive participant will receive a certificate. European Music Institute Vienna and its contractual partners are entitled to produce film-, video-, photo- and audio-recording material about European Music Institute Vienna and its events. Those photos and film-, video- and audio-recording materials, which will only be published within a duration of three (3) minutes, may be published without any restriction regarding time, place or technique and may be recorded on any kind of technical object. It may be duplicated, diffused, rented and broadcasted in radio, television, notably in regard to online and mobile techniques, with any kind of present or future technical procedure. Any commercial utilisation is excluded. Participants take note that the data stated by him or her will be stored and processed according to the terms of the data protection law. For more information please see to our Data Protection Declaration. Applications only become valid as of the date of receipt of the deposit payment as stated in the course description. All applications and course fee payments must be received by application deadline (generally 01 June 2019, unless stated otherwise in the course description). Early bird payments are due until the Early bird deadline 15 March 2019, payments for other special offers as indicated in the offer. Payments must be made in Euros. including the memo text: Registration ID, name of student and course professor. (Erste Bank, Landstraßer Hauptstr. 58, A-1030 Wien). Partial scholarships are available on a limited basis. 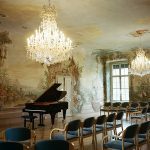 Please contact the European Music Institute Vienna administration. For passive participation please follow the instructions on the individual course page. For written cancellations by the day of the application deadline, the course fee will be refunded; an administrative fee of EUR 150 (one hundred and fifty Euros) will, however, be retained. Please always indicate your bank account information in case of cancellation! A refund of the course fee for withdrawals after the day of the application deadline is only possible in proven cases of force majeure (e.g. illness, accident, death in the family); the deposit will, however, be retained. Such withdrawal must be effected before the course begins. For later cancellations, the full course fee will be retained. The participation at every course and/or event of European Music Institute requires respectful behaviour towards teachers, other participants and an appropriate conduct in the rooms of the castle, its outbuildings and parks. In case of any misconduct of a participant the organisation reserves the right to exclude this participant from the course/event. Please note that in such case the course fee is not reimbursed. The parent or legal guardian who concludes the contract for participation at European Music Institute Vienna on behalf of the participant who is under age, declares his or her agreement with the fact that European Music Institute Vienna cannot assume any responsibility for supervising the participant who is under age. This applies in particular to behaviour immediately before the beginning of the master-class/course or at the end of the master-class/course and outside the rooms where the master-class/course is held. Every registration of a participant who is under age requires a signed declaration by the parent or legal guardian to this effect. The parent or legal guardian is responsible for damage caused by the participant who is under age. Furthermore, the parent or legal guardian indemnifies European Music Institute Vienna concerning all claims to compensation which are asserted by the participant who is under age. It is agreed that Austrian law applies for all conflicts resulting from or related to the business relationship under exclusion of norms of international private law and of the UN Convention on Contracts for the international sale of goods. The place of jurisdiction for all conflicts resulting from or related to the business relationship is Vienna, Austria. Note: The English version of the Terms and Conditions of Participation is a convenience translation. In case of differences between the German and English versions, the German wording shall be decisive. Sollte die jeweilige Mindestanzahl gültiger Anmeldungen für einen Kurs bis zum generellen Anmeldeschluss (01. Juni d.J., sofern nicht in einer Kursbeschreibung ein anderer Termin genannt wird) nicht erreicht sein, so behält sich die Kursleitung das Recht vor, die Anzahl der Kurstage zu verkürzen (Intensivkurs), wobei die Unterrichtseinheiten für jeden Teilnehmer dadurch nicht verringert werden, oder ggf. abzusagen. Der/die Teilnehmer/in nimmt zur Kenntnis, dass die von ihm/ihr im Zuge der Anmeldung angegebenen Daten unter Beachtung der Bestimmungen des Datenschutzgesetzes gespeichert und verarbeitet werden. Zur weiteren Information lesen Sie bitte unsere Datenschutzerklärung. Bei schriftlicher Abmeldung vor dem Anmeldeschluss wird die eingezahlte Kursgebühr abzüglich einer administrativen Gebühr von EUR 150 (Euro einhundertundfünfzig) zurückerstattet. Bitte geben Sie im Falle einer Abmeldung unbedingt Ihre Bankverbindung an. Eine Rückerstattung der Kursgebühr bei Abmeldung nach dem Anmeldeschluss ist nur in nachgewiesenen Fällen höherer Gewalt (z. B. Krankheit, Unfall, Todesfall in der Familie), abzüglich der nicht erstattungsfähigen Anzahlung, möglich. Eine derartige Abmeldung muss spätestens bis zum Beginntag der Meisterklasse / des Workshops erfolgt sein. Bei späterer Abmeldung wird die volle Kursgebühr einbehalten.